Weird: When Legs Grow Out A Deer’s Body! 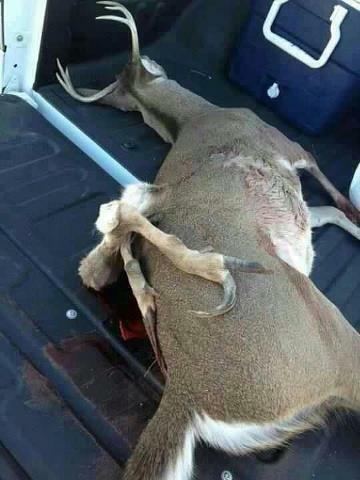 A guy emailed this picture of a deer with legs growing and flopping out its back. Don’t know when or where it was shot. I’ve seen it before, so it was a few years ago. Photoshop? Looks legit to me. From the scant research I could find on this type of genetic abnormality, scientists say on the very rare occasion when legs grow out of a deer’s body, they were likely those of a twin that didn’t form all the way. According to this QDMA post this is most likely a case of a “parasitic twin.” Twin fawns probably began to develop inside a doe, but the twin embryos did not completely separate and one of them stopped developing normally. The legs on this buck’s back may actually be non-functioning remnants of the twin that failed to develop fully, but that remained attached to the healthy embryo. Parasitic twins are rare but have been documented in many animal species and even in humans. This entry was posted in Big Bucks, BigDeer, Deer Hunting, Deer Science, Hanback, whitetail deer by admin. Bookmark the permalink.